When you’re ready to launch an SEO campaign, your main hurdle lies in its funding. You’ll find that big-name agencies charge a lot of money each month but that hiring a full-time manager or even a group of specialized contractors for your SEO will charge you just as much money. • Instead of investing a custom-built website, make sure the builder you use is SEO friendly. • Spend some time researching strong keywords and topics because this is what you’ll base all of your other work on. • Optimize your site’s titles and meta descriptions since they show up in SERPs so you want them to entice visitors to your site. • Create strong content for every page of your site. Main pages need several hundred words that accurately and concisely describes its purpose. • Build your off site presence includes claiming your brand’s social media profiles on all the major social platforms (take your time and completely fill in the description sections) then making regular posts to them, occasionally linking to your site’s content. • Encourage your social media audience to share and link to your content so your domain authority grows naturally and you reach and engage with more people. • Build links by being a guest writer on other sites. • Continually share and syndicate content so you get more links. Although most of the work you’ll do on your SEO campaign only needs completed once, there are things you’ll need to continue working on (e.g. content creation). Some of these things are challenging, but by remaining focused you’ll be successful. 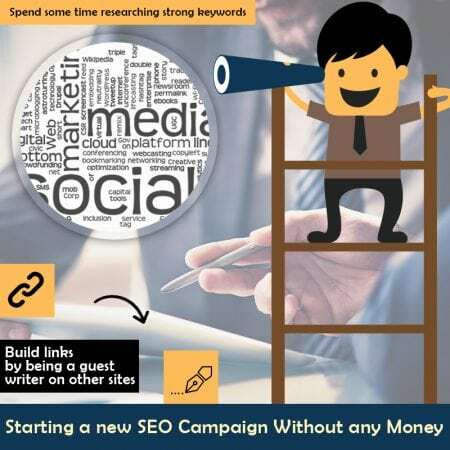 Although you can start a campaign without any money, you won’t get the SERPs you want. Today, the SEO world is simply too competitive for this. As such, you must spend a lot of time often creating high-quality content and earning links from high-quality publishers. This is the only way you’ll build a loyal audience. These are things you can definitely do on your own, but it’s much more efficient to hire an expert to do this work for you. After all, you’re not only new to this but you’re already doing a lot of work for your business. An expert can concentrate on SEO – giving you guidance and getting the work done for you there. Every dollar you spend on SEO will give you a great return on investment. Of course, this does depend on who you have do this work for you. With over 10 years of experience here at Local SEO Tampa, we invite you to contact us today. We look forward to showing you how much we can truly improve your site so that it brings you new business.